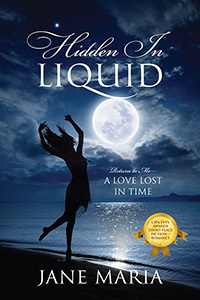 Jane Maria’s “Hidden In Liquid: Return to Me – A Love Lost in Time.” Widowed Marisa comes to a time in her life for a new dream. She buys a haunted house near the Great Liquid…the ocean. She comes to realize the house wants to draw her into a realm where past and present merge. She surrenders to her celestial sister, MoonGlow, and the moon’s ancient lover High Tide in an ecstatic dance of fate. Marisa will truly discover what lies hidden in liquid. Previous Previous post: Show Your Book a Little Love This Month With $300 in Spending Money!